Remembering Bob Hoskins - Can We Still Be Friends? British actor Bob Hoskins has died of pneumonia at age 71. Early in his career, he made a name for himself in British film and television, most notably The Long Good Friday, and Mona Lisa, where he established his reputation for complex, hard-nosed, gritty roles. His major introduction for American audiences was in 1988’s Who Framed Roger Rabbit? which was recently named by Time Out New York as one of the top 100 animated films of all time. The role combined his talents for deep, tough-guy types with a genuine talent for comedy. Hoskins role as Smee in 1991’s Hook further endeared him to the generation that grew up in the late ’80s/early ’90s. He continued to work steadily for the rest of his career, notably in Mrs. Henderson Presents and Made in Dagenham. His final role was in Snow White and the Huntsman, after which he retired from acting in 2012 after being diagnosed with Parkinson’s disease. As a huge fan of Hook as a youngster, I knew Hoskins only as Smee for a very long time. Hoskins performance as the doting, put-upon right-hand man/doormat gave the entire pirate band a heart that subtly put 7-year-old me at ease, knowing that even if the kids were trapped with the pirates, maybe they’d be all right with Smee around. Hoskins injected the same underlying emotional warmth to almost all of his characters. Though I expanded my knowledge of his important works later in life, I was still astounded by his ability to infuse even the dirtiest and toughest of his characters with vulnerability and honesty. For me, his stand-out work is in Neil Jordan’s 1986 film Mona Lisa (for which he won his first BAFTA and only Oscar nomination) as George, a man recently freed from prison who takes a job as a driver for a high-priced prostitute. Again, I was astounded by his ability to simultaneously embody George’s aggression and his apprehension. If you’re not familiar with Hoskins’ work, there’s no time like the present to begin appreciating his art. 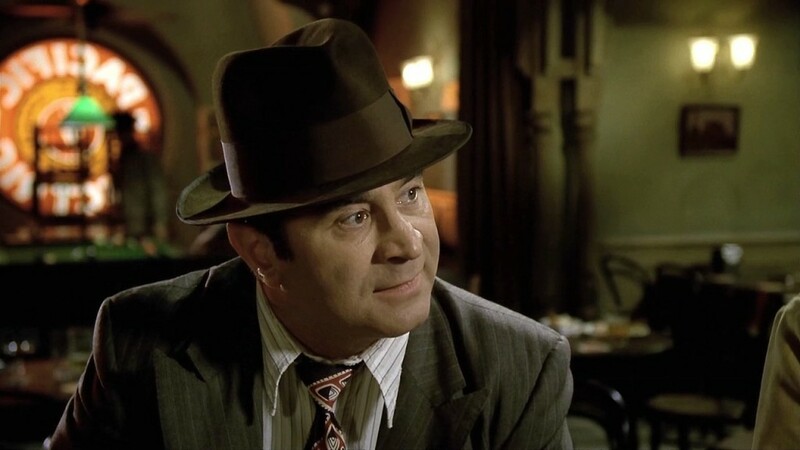 ~I was saddened to hear of the death of Bob Hoskins at an age when he should have been looking forward to a decade of great geezer parts. He was terrific in the original 1970s telly version of Pennies From Heaven (I’m not a big Dennis Potter fan, but on Pennies the trick had not yet worn stale), way better than Steve Martin in the Herb Ross Hollywood version – if only because the sight of the pugnacious Hoskins singing and dancing was so perfect a summation of the gulf between aspiration and reality. At the end of that decade, The Long Good Friday made Hoskins a movie star in Britain, and then Who Framed Roger Rabbit? * and all the rest made him a name in America. I’ve never forgotten the end of The Long Good Friday. Hoskins is an East End mob boss who walks out of the Savoy thinking everything’s all set, and calls for his car. That’s great stuff, and a good point. I think that Hoskins probably had a couple really great roles he could have played, bringing his gruff/vulnerable countenance to roles that might be less nuanced in lesser hands. When great artists pass, it’s so painful to think of what more they could have created. Bob Hoskins (almost) always had a twinkle in his eye. He was having fun on screen and wanted us to share it. (See “Mermaids” for LOL funny). Absolutely. He definitely enjoyed his job in a way that leads you to believe he never took it for granted. He never planned on being an actor, he accidentally found himself in an audition for a play, and instead of explaining the mistake, he tried out and got the part. It seems like that experience was a lesson in how easily work could be given and taken, so he set out to enjoy himself and threw himself into each role like it could be his last.